Welcome to another January 2015 issue of GL Communications' Newsletter providing information and insight into our enhanced RTP Testing and Simulation Tool referred to as RTP ToolBox™ Software - A tool that helps test, simulate & monitor traffic carried by RTP & RTCP Packets. As traffic intensity increases, network elements (including switches and transmission) can impart various impairments such as errors, excessive delay, congestion, blocking, loss, and degraded quality. Simulating traffic over IP networks can be valuable to characterize the impairment as a function of traffic intensity and traffic types (e.g. Voice, Fax, Data, and Video). RTP ToolBox™ is designed to generate and monitor RTP and RTCP packets independent of call-signaling protocols such as SIP, UMTS, GSM, SIP-I, H.323, MEGACO, or MGCP. The tool is perfect for testing and developing enhanced voice features like Voice Activity Detection (VAD), echo cancellation, a host of different codecs, digit detection, digit generation, Fax over IP, jitter implementation, and much more. It can be used to test end-user equipment such as IP phones, Analog Telephone Adapters (ATAs), and Gateways and Routers that support VoIP. RTP ToolBox™ is rich in visual presentation of voice quality statistics that significantly simplifies debugging and analysis of VoIP calls. It is also integrated within many other GL's IP simulation products such as PacketGen™, VQuad™, MAPS™ UMTS IuCS & IuH, MAPS™ SIP, MAPS™ SIP I, MAPS™ MGCP, MAPS™ MEGACO, and MAPS™ GSM A over IP to support RTP traffic simulation. An RTP session can be created either 'Manually' or using 'Auto-Scan for Incoming Session' feature which displays incoming RTP streams to the system. It is possible to configure the properties such as codec, payload type, packetization time etc for sending/receiving RTP traffic with Tx/Rx profile option. Users can manually introduce Impairments and transmit on the RTP sessions. Users can also create a script that defines the RTP behavior. Scripting option provides the users, a greater flexibility to combine traffic actions with simple programmed scripts. RTP ToolBox™ application can be used to generate in-band digits and tones. The supported tones include single, dual, and multi-tones. Supported digits include DTMF, MF, and MFR2 forward and backward digits. The generation of RTP Events/ Digits per RFC-2833 & RFC-4733 are also available. RTP ToolBox™ application allows users to capture tones and digits in the traffic. It also displays additional information about the captured signal such as type of the signal, timestamp, event, power, and accept/ reject frequencies. This is completely supported for both in-band Digits/Tones and RTP Digits/Events per RFC-2833 & RFC-4733. RTP ToolBox™ allows users to configure and simulate a user agent (UA) for manual SIP call generation and reception using public URL and contact IP addresses. Multiple SIP calls can be placed and received through a single user agent. Oscilloscope and Spectrum Analysis: In oscilloscope the PCM codes (amplitude of the incoming signal) for any selected session are graphically displayed in real-time as a function of time. The spectrum analyzer displays data received in spectral domain (Spectral Amplitude vs. Frequency). A Fast Fourier Transform (FFT) is applied to successive sample sets of the incoming data and displayed in graphic form. The FFT length can adjust the frequency resolution I e from 32 points to 8192 points. Jitter Buffer feature allows user to set the buffer used for delayed packets that arrive at receiving end. Both static and dynamic jitter buffers are supported. RTP ToolBox™ also provides Speech Quality Metrics (R Factor & MOS) and Statistics Reports of RTP and RTCP packets transmitted on a session such as Number of Packets Sent, Packets Received, Dropped Packets, Out of Sequence Packets, Sender Reports, and Receiver Reports and are also displayed using RTP/RTCP statistics applications. 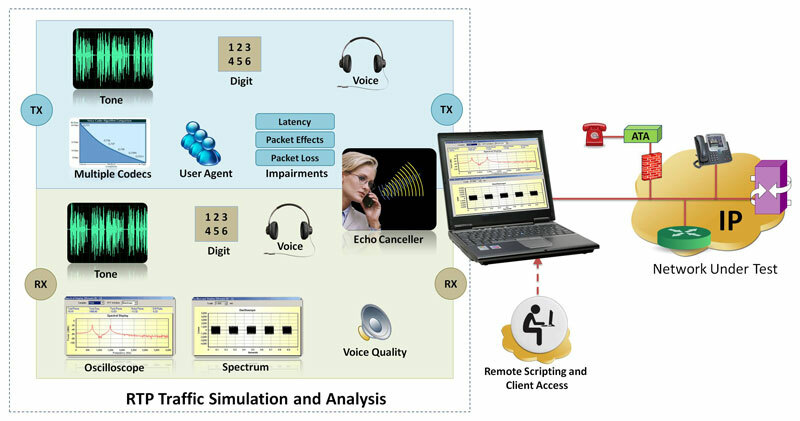 The RTP ToolBox™ application provides multiple features to perform Voice Quality Testing over IP networks. The software can send and record the voice files over the "network under test" either manually through GUI or programmatically through client-server scripts. Different codec types, impairments, jitter buffer, and latency events can be set to simulate the necessary network conditions. Complete automation can be accomplished using the TCL client scripting. RTP Toolbox™ supports various codec types includes G.711, G.729, G.726, GSM, AMR, EVRC, SMV, iLBC, SPEEX, G.722, and more. AMR, EVRC variants requires additional licenses. The application also helps users to customize codec options (payload type, ptime) over established RTP sessions. For complete details, on supported codec, please visit Voice Codec web page. RTP Toolbox™ provides complete G.168 Codec Compliance Testing and all 13 tests are supported. The below diagram depicts how the RTP ToolBox™ tool can be used to perform Media Gateway Testing. The below diagram shows how the RTP ToolBox™ tool can be used to perform G.168 Tests to check Echo Cancellation functionality of ATA. For comprehensive information on the application, please refer to RTP ToolBox™ software web page.